Occupational safety and health, which protects workers’ lives and wellbeing, is the foundation of a company’s existence and a fundamental corporate social responsibility. Tokyo Gas Group believes that the values of Safety, Security, and Reliability that we advocate for our customers as our corporate brand can only be accepted when we consistently secure our own occupational safety and health. We consider occupational safety and health to be one of the most important challenges of corporate management. Our Group places the highest priority on ensuring safety and health, and enforces compliance, including adherence to all related laws and regulations, and making every effort to eliminate the risk of disasters and accidents toward securing an excellent safety and health record. To put its Basic Policy into practice, the Tokyo Gas Group takes concerted action to promote safety and health in line with objectives established by workplace leaders in each organization based on the following Group-wide Occupational Safety and Health Policy. All employees, from top management down, will actively promote safety and health activities to safeguard the safety and health of each individual. With full awareness of its public mission and social responsibilities, the Group will strictly enforce internal rules on safety and health, work procedures, etc., as well as legislation, such as the Industrial Safety and Health Act and Road Traffic Act. Particularly in 2018, we will fully comply with the “13th (2018–2022) Occupational Health and Safety Program” set by the Ministry of Health, Labor and Welfare as well as the Industrial Safety and Health Law amendments. The Group will further enhance its occupational safety and health management system (OSHMS) in tandem with the permeation of chemical risk assessments. Furthermore, we will strive to reduce the risk of accidents by intensifying our efforts to eliminate human error. We will also strive to eliminate all serious accidents in the workplace by ensuring “point and check” procedures and strengthening safety awareness. To reinforce the Tokyo Gas brand’s corporate brand Safety, Security, and Reliability, workplace leaders will take the initiative to prevent traffic accidents. Particular attention will be paid to reducing accidents caused by younger and senior employees, parking area accidents, and accidents caused by carelessness toward a 20% reduction year-on-year in the number of traffic accidents associated with negligence as well as accidents causing injury to others. Action will be taken to ensure that all employees receive health examinations and to implement a stress check program throughout the organization. The Group will use the results to enhance measures to prevent employee mental and physical illness and maintain and improve their health. The Group will particularly follow up on guidelines for preventing passive smoking while reviewing and implementing measures to discourage smoking altogether. Our firm commitment to safety and health activities is intended to support Tokyo Gas Group member companies in more efficiently and completely conducting their own proactive health and safety initiatives. The Tokyo Gas Group has established a Central Safety and Health Committee, which is chaired by the executive officer responsible for the Personnel Department. 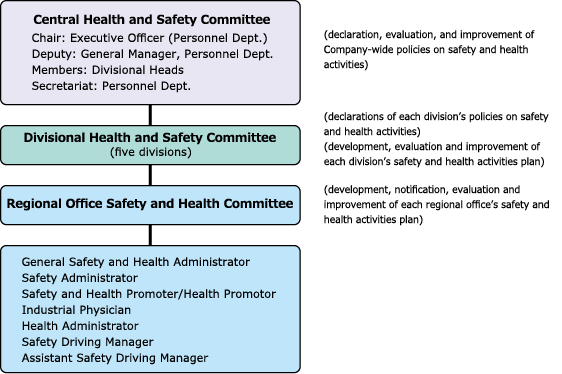 The committee formulates policy on safety and health activities and reviews and promotes the implementation of measures to prevent accidents and disasters as well as to improve mental and physical health across the Group. It also determines the Group’s safety and health promotion awards. If necessary, the committee reports on issues under consideration to the Corporate Executive Meeting and the Board of Directors for final discussion and decision-making. Tokyo Gas has in place a company-wide occupational safety and health management system to prevent industrial accidents. This includes further reinforcement of the occupational safety and health activities undertaken by each workplace on a daily basis. 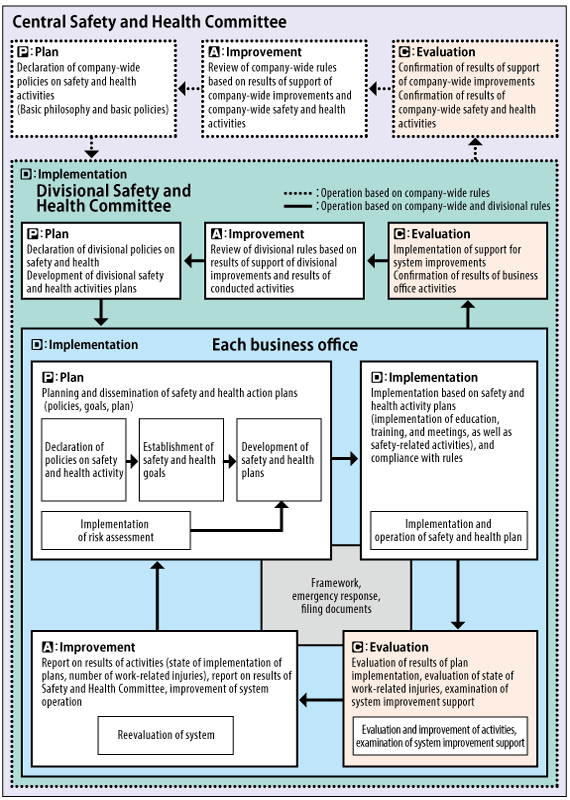 Under the Central Safety and Health Committee, each workplace proactively implements applicable measures. And we plan to enhance our OSHMS by implementing all industrial safety and health activities using PDCA cycles as well as by complying with related regulations, such as the Industrial Safety and Health Law, through periodic reviews and validation of our occupational safety and health management system. Risk assessments enable us to quantify potential accident risks and then take action to reduce or eliminate them. Since 2016, we have been complying with mandatory chemical risk assessment to raise awareness of these risks. To prevent traffic accidents, the Company provides driver training programs that utilize outside facilities for new drivers, drivers with a history of accidents, and middle-aged and senior drivers who have been licensed under our own in-house system. When employees renew their licenses (in principle every five years), they receive behind-the-wheel instruction from outside driving instructors using drive recorders. Participants are able to correct unsafe driving habits and adopt safe ones by improving their driving skills and becoming aware of their own driving behaviors. With a top priority on safety, various training programs and other opportunities raise driver awareness of the importance of “stop and look,” resulting in fewer traffic accidents. Moreover, we strive to prevent accidents by incorporating “Safety Support Car” systems, which we have been promoting since fiscal 2017, in all vehicles. We also assign specially trained safe-driving instructors to each workplace in order to provide instruction through both behind-the-wheel and classroom sessions. In addition to these initiatives, we periodically publish a safety management guidebook, provide information to safe driving managers and utilize opportunities presented by the government’s spring and autumn nationwide traffic safety campaigns in order to provide detailed traffic safety information to every workplace and raise safety awareness. We are implementing multi-level educational programs on occupational safety and health as well as safety awareness. In addition, we provide educational programs for the development of legal managers. *1 Data is for regular and semi-regular employees of Tokyo Gas. *2 Includes accidents that do not result in lost worktime. *3 Rate of people taking work leave per 1 million actual work hours. *4 Number of workdays lost as a result of accidents/injuries per 1,000 actual working hours. *6 Lost work time rate: rate of employees taking work leave due to accidents per 1 million actual work hours. *7 Severity Rate: rate of lost working days due to accidents per 1,000 actual work hours. Tokyo Gas created a Health Insurance & Employees’ Welfare Section within the Personnel Department. A number of occupational health activities are conducted under the leadership of our occupational physician. Moreover, we are committed to providing checkups for 100% of our employees as a fundamental means for raising their awareness of their own health. Also, we support the early detection of diseases, the effective use of outside medical institutions, and follow ups for employees who require further attention. Close collaboration with workplaces and individuals facilitates the provision of counseling for mental health, improving workplace environments and preventing the recurrence of illness, with the overall objective of maintaining and improving employee well-being. Additionally, health-related information is shared across the Group companies. We are strengthening our efforts to manage mental health issues, since about 60% of all sick leaves taken are due to mental health concerns. We are developing and implementing the following activities to prevent lifestyle-related diseases. Health management support is offered to the growing number of expatriates in the wake of the globalization of our business. To minimize the threat of infectious diseases, we established a countermeasure office and are implementing preventive initiatives. We provide lectures on health management and encourage employees to attend them. 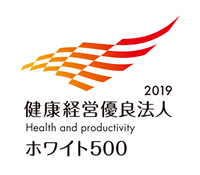 We are accredited as a 2018 Health Management Superior Corporate (large enterprise division)—White 500—as determined by the Ministry of Economy, Trade and Industry in collaboration with the Japan Health Conference. The healthcare management superior corporate accreditation system is designed to recognize large, mid-size and small corporations with exceptional healthcare management, in accordance with the regional health issues and the health promotion initiatives promoted by the Japan Health Conference. Our recognized efforts include attainment of 100% participation in regular health checkups for employees, the promotion of measures to prevent passive smoking, lifestyle-related diseases and mental health issues.